We enjoyed a nice meal last night at Restaurant Pichidangui, which seemed to have had a face lift, or did they just put in brighter lights and clean table cloths? Breakfast was a little later today, to allow the lady who was scrambling the eggs to attend to church duties. There was still time left for a quick look at the rocks – Angie had only visited the area north of the church, so we headed to our usual spot south of the church.(S286). 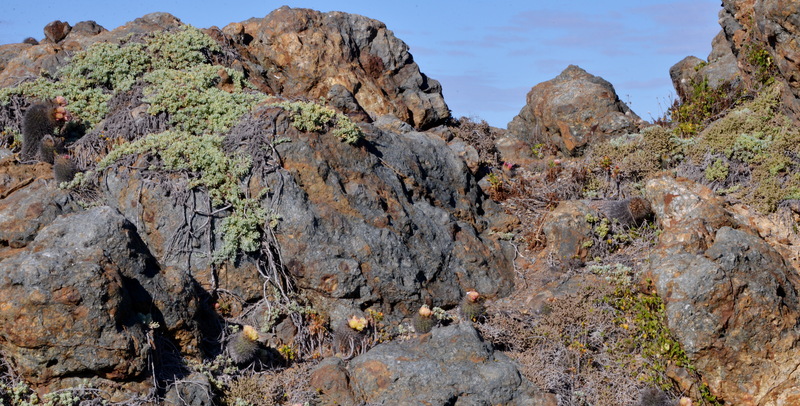 As in previous years the Carpobrotus chilensis was taking over and smothering the Eriosyce and even crowding out the Eulychnia. Attempts had been made at some landscaping and weed clearing, but it looked as though the label ‘weed’ had been applied to the wrong plants. Never mind, there were enough still in tact and flowering closer to the water’s edge, where conditions were a little harsher. Next we were off to the Airport. When we had picked the car up on Saturday 12th, we had been told that the papers to take the car into Argentina would be ready on Monday 14th or later in the week. As we were passing by the Airport today, now was a good time to pick them up. It took all of 3 minutes. As we needed to stretch our legs, Angie decided that now was a good time to buy some souvenirs, as the traditional Chile cups and T-shirts back home were in need of updating. First, for those who have been to the International Departures area of the Airport – pre check-in, they have moved the souvenirs stall to a larger area opposite the old one, which now provides extra space for the security bottle-neck. Second, all the old favourites were gone and I was not that impressed with their replacements. There was a little stall selling mobile phones, mp3 players and associated paraphernalia, where a gentleman with excellent command of the English language confirmed that he had the cable that I needed to end my musical starvation. Did I want the 30 cm, 1 m or 3 m long cable? 1m would be fine! And so, after an anxious moment when I worried that the car’s Hi-Fi might have been faulty, the dulcet tones of Carlos Santana filled the car. Great!! 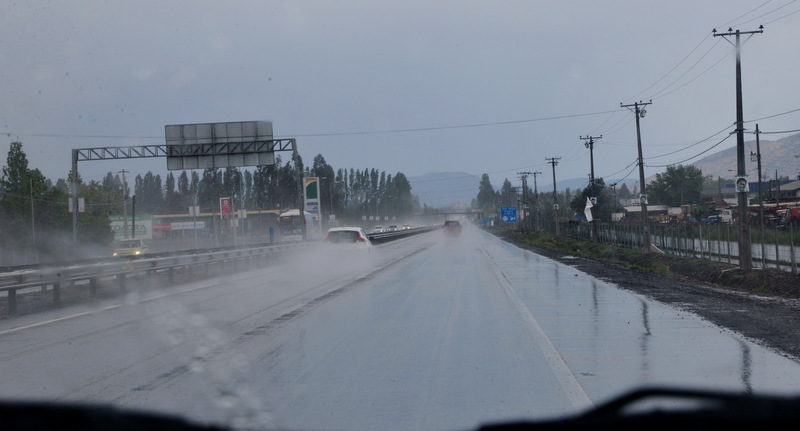 I had pencilled in Talca as a place where we could spend the night, but with heavy rains preventing any local sight-seeing, we pushed on until around Chillán where it seemed a good idea to ask SatNav for a place to spend the night. It sent us down a road in the middle of town with lots of seedy looking hostals, but the flag pointed at a nice modernised building where we were pleasantly surprised by the high standard of fixtures & fittings. I thought of taking pictures to show the Hosteria in Vallenar for some ideas of what others provided for a good deal less money! I guess they would have pointed out that they were some 1,000 km apart, therefore no competition. Sunday night seems to be when restaurants here close for the evening, so we were fortunate to find a Baverian / German styled eatery that was open and served pizza’s (Jawohl!) and beer (Cristal) which we finished off with a large slice of kueche. There goes the diet again! Tomorrow we head into the mountains and hope for brighter weather. Thanks for preparing us on a dry Chile tour this year. Have a nice time in Argentina. Spiniflores (Juan Acosta & Florencia Senoret) Blog, including 2010 Cactus trips Spanish language Cactus Trip Diaries, with pictures. Wednesday 27 September 2017 – One month to go!